(L.-R.) Bill Byrne, VP Global Sales; Geraldine Colton; Dara Mc Mahon, Director Global Marketing & Digital Experience; Sharon Persaud, Helen Maguire, Director Consumer Sales & Marketing NA. On January 17th, at JFK’s Terminal 5, Aer Lingus unveiled a brand refresh inclusive of an updated logo and new aircraft livery, firmly positioning the airline as a modern and contemporary Irish brand that competes in an international market. The new brand identity supports Aer Lingus’ ambition to be the leading value carrier across the North Atlantic. It’s the first brand refresh for the airline in twenty years. 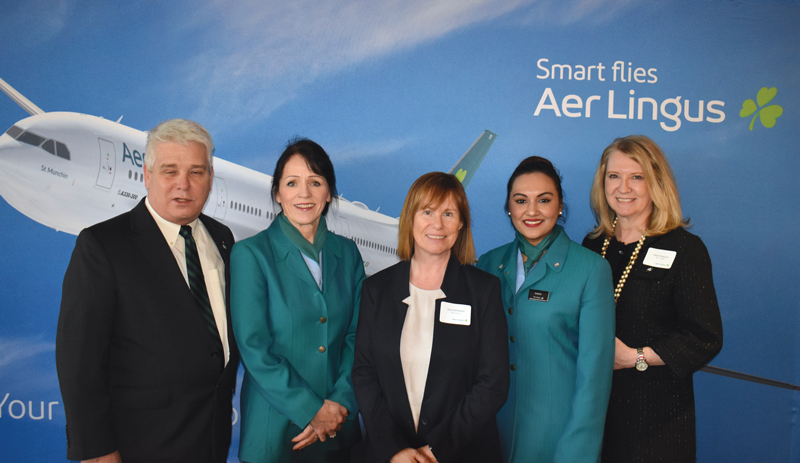 And to celebrate this occasion, Aer Lingus had a party inviting Metropolitan Airport News and many others in the JFK Aviation community to share in their proud moment. In the tradition of Irish warmth and hospitality, there was plenty of food and drink at the party to keep even the most jaded visitor happy. How often does an airline invite guests into their hangar to see new livery first hand? The brand refresh is part of the airline’s ambitious growth plan which will see Aer Lingus increase its North Atlantic fleet from 17 to 30 aircrafts by 2023. Overall, Aer Lingus plans to grow its A330 fleet to 16 aircraft (from 13 in 2017) and invest in 14 new A321LRs to provide capacity for growth across the Atlantic and within Europe. Aer Lingus embarked on the brand refresh with Lippincott to solidify their position in the market. At the center of the brand refresh is a restyled logo, adding a tilt to Aer Lingus’ iconic shamrock to symbolize dynamism and speed, with heart-shaped leaves reflecting the warmth and hospitality of the brand. Guests will see four shamrocks on the new Aer Lingus aircraft; the first within the new logo, the second on the tail, a third on the entry door, and a final surprise on the wingtip providing prime positioning for capturing on social media. The Aer Lingus logo font has changed to ‘diodrum’ and the dominant color is teal. The body of new Aer Lingus aircraft will be white with a teal-colored tail and engines, bringing a sleek, contemporary feel to the design. A teal undercarriage will make an Aer Lingus plane instantly recognizable to those on the ground. 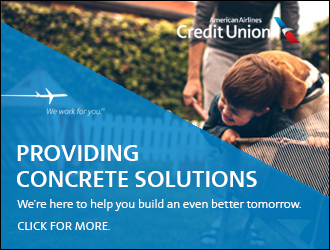 The brand refresh rolled out across all brand platforms, including a new website and app design, and will be visible across all guest touchpoints, from check-in to the boarding gate and on to the aircraft. The brand refresh is being delivered in keeping with Aer Lingus’ value carrier model, as part of the company’s business-as-usual aircraft painting program. All new aircraft will be delivered sporting the new livery and the updating of digital assets has been done in a highly cost-effective manner. Sean Doyle, Chief Executive Officer, Aer Lingus states: “Aer Lingus is a modern Irish international success story, built on hard work, enterprise and the commitment of our people. We’re delighted to unveil our brand refresh today, which comes more than 20 years after Aer Lingus last invested in new brand livery, and reflects our position as a modern, contemporary airline. Aer Lingus has had exceptional success in recent years: adding new routes, new aircraft, new jobs and new opportunities for colleagues and guests alike. The refreshed brand reflects an airline that connects those living in Montreal to Marseilles; in Berlin to Boston; as well as those living in Cork to Croatia. The benefit for Ireland of being at the fulcrum of such connections is considerable and we in Aer Lingus are determined to realize this potential for Ireland. We have ambitious plans for our future and the years ahead and are aware of the challenges facing the modern industry, which led to the investment in our new brand identity and livery. And for our final word to our new friends at Aer Lingus, ádh mór.